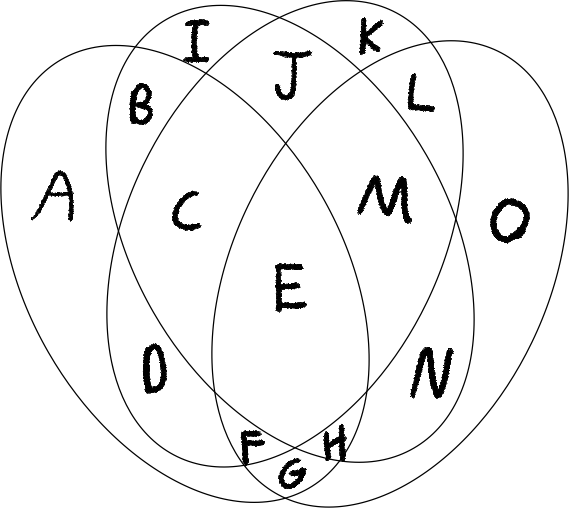 These four ellipses represent four sets and all the possible ways they can intersect (a Venn diagram, in other words). 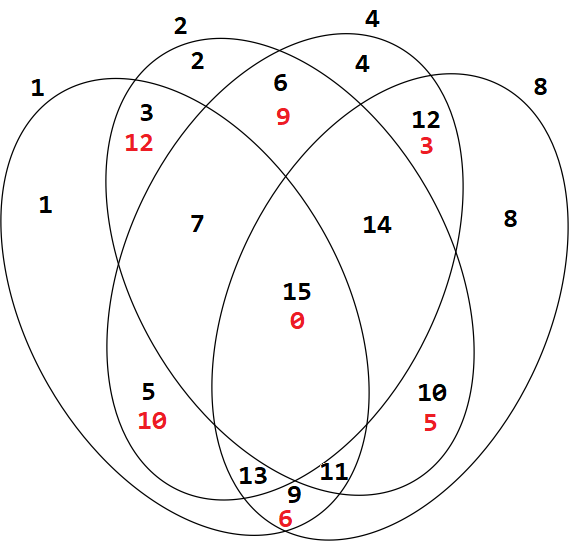 There are 8 regions inside each ellipse, and 15 regions altogether. 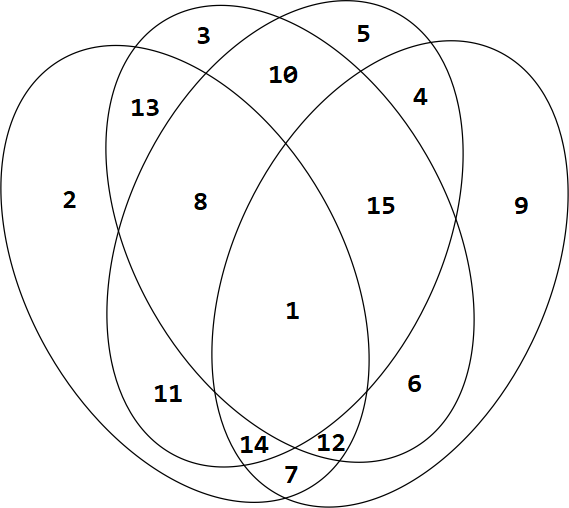 Is it possible to assign the numbers 1 to 15 to the fifteen regions so that the sum of the numbers in each ellipse is the same? Here is a method for constructing a solution without the use of a computer. Associate the first four powers of $2$ with the ellipses, i.e. label them $1$, $2$, $4$, and $8$. Then for each region, give it the number that is the sum of all the ellipse numbers it lies in. While this assigns the numbers $1$ to $15$ to the regions inside the ellipses, the ellipses don't all add up to the same amount. This is because of that one bit that all the regions within an ellipse share. Here is a different method that I believe generalises to any number of sets. I will use 5 sets in this description. 2. If the region lies in an odd number of the sets A,B,C,D,E, then add $2^4=16$. 3. If the region lies in an odd number of the sets A,B,C,D, then add $2^3=8$. 4. If the region lies in an odd number of the sets A,B,C, then add $2^2=4$. 5. If the region lies in an odd number of the sets A,B, then add $2^1=2$. 6. If the region lies in an odd number of the sets A,C, then add $2^0=1$. The number you end up with is the number for that region. Put differently, if a,b,c,d,e are variables which are $1$ if the region lies in a particular set and $0$ otherwise, then the region is given a binary number where the bits are (a^b^c^d^e), (a^b^c^d), (a^b^c), (a^b), (a^c) where the ^ symbol indicates the exclusive or (XOR) operation. The order of the bits does not matter. I think you are even free to use any XOR expressions of the variables, as long as they are linearly independent and contain at least one XOR operation. Each section is identified and placed in an array based on their letter's alphabetical index. The program then uses a brute-force approach. It works how you would expect, it cycles through every possible permutation and outputs a solution if the sums of each set are equal. You can view the output here. There are many solutions based on my code. If you want to see all of them just compile and run the code linked at the top of this post. Or view the linked youtube video showing a small amount of the many there are. So it is possible and there are many solutions, not just one - given that my code is correct. Not the answer you're looking for? Browse other questions tagged mathematics combinatorics arithmetic or ask your own question.